CHAUVET®, a leading manufacturer of LED lighting, announces a new effect light called Cubix™. Cubix™ is a centerpiece fixture that features two popular multicolored effects that can be controlled independently—perfect for mobile DJs and small clubs or bars. Sixty-four RGB LEDs mounted in the center produce colorful flowing effects and animations, while the quad-sided derby effect powered by two tri-color LEDs rotates beams around the dance floor. 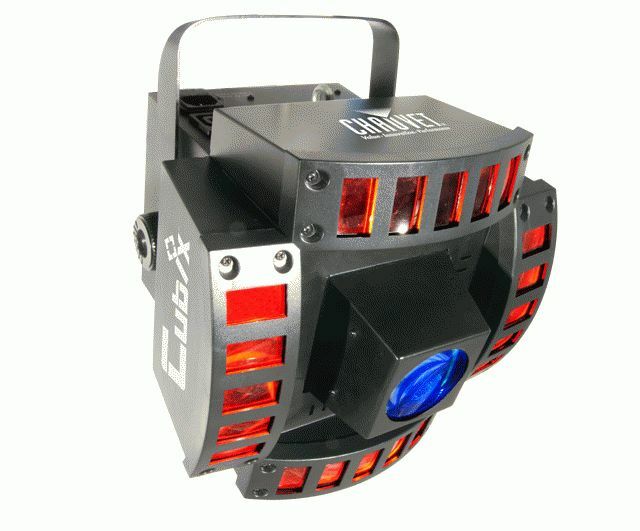 Cubix™ can be set up to give a full out barrage of light or to deliver a specific effect, one at a time. User-selectable colors in stand-alone mode allow customized looks without a DMX controller. Sound-activated programs synch the light shows with the beat of the music. Cubix™ allows power linking for multiple units saving time while running cables and extension cords. Plus, there are built-in automated programs via master/slave or DMX.